Ube Maja Blanca is a delicious spin on our classic coconut pudding. Loaded with purple yam flavor and topped with golden coconut curds, it’s a fantastic snack or dessert you’ll love! Ube maja blanca was one of the recipes I made before Christmas and planned to post for the holidays but never got to because I misplaced the SD card that stored the pictures. I was quite bummed out about my carelessness/forgetfulness as the dessert would have made a fantastic addition to your party menu. I spent a good few days tearing down the house trying to find it, but as it turned out, I didn’t look hard enough. Or more correctly, I didn’t look in the right place. Maja de Ube is a delicious variation of the maja blanca espesyal on the blog. This coconut corn pudding happens to be one of my most popular recipes here on Kawaling Pinoy, and I am so excited to give it a new twist with ube flavor. Ube maja blanca is a sweetened mixture of coconut, evaporated, and condensed milk with cornstarch added to thicken it into a luscious pudding consistency. While corn is the flavor base for traditional maja, this version is made extra delicious by mashed purple yam. Latik or coconut curds are my topping of choice here, but you can also use toasted desiccated coconut or coconut sport strings (macapuno). Make the latik before you proceed with the rest of the recipe as you will need the rendered coconut oil to grease the baking pan lightly. The recipe calls for two cups of cooked and mashed purple yam. I use frozen grated ube as fresh is hard to find here in the U.S. If you’re using the frozen package as well, make sure to thaw and drain completely as the excess liquid might affect how the pudding will set. I add ube extract mainly to pump up the color; you can use more or less as called for in the recipe depending on the depth of color you prefer. I like to brush the pudding with coconut oil for aroma and flavor, but I suggest skipping this step in colder weather or if you’re storing the dessert in the fridge as the oil will harden to an unappetizing film of fat. The sweetened milk mixture should thicken very quickly when the cornstarch slurry is added so whisk vigorously to prevent lumps. The consistency you’re looking for is a very thick paste. This ube version is a bit sturdier than the special maja we have on the blog because of the addition of purple yam; add extra 1/2 cup coconut milk if you prefer a softer texture. Ube Maja Blanca is a delicious spin on our classic coconut pudding. Loaded with purple yam flavor and topped with golden coconut curds, it's a fantastic snack or dessert you'll love! In a pan over medium heat, add coconut cream and bring to a boil. Continue to cook, stirring occasionally, until liquid starts to thicken. Lower heat and simmer. As oil starts to separate and solids begin to form, regularly stir and scrape sides and bottom of the pan to prevent from burning. Continue to cook and stir until curds turn golden brown. In a fine-mesh sieve, drain latik from the oil. Set aside. Brush bottom and sides of a 9 x 13 baking dish with coconut oil (from cooking the latik). Set aside. In a large pot, combine coconut milk, evaporated milk, condensed milk, mashed ube, and sugar. Stir well until smooth and blended and sugar is dissolved. Over medium heat, bring to a boil, stirring occasionally. Add ube extract, if using. Stir until well-dispersed. In a small bowl, combine water and cornstarch. Stir well until cornstarch is dissolved. Gently add cornstarch mixture into milk mixture, whisking vigorously to prevent lumps. Continue to cook, whisking continuously, until mixture thickens to a paste (mixture will thicken fast). Transfer mixture into prepared dish, smoothing top with a lightly oiled spatula or knife. Allow to slightly cool, cover and refrigerate for about 1 to 2 hours or until completely cooled and set. Brush top with coconut oil and top with latik. Cut into squares to serve. 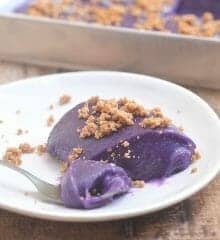 Can i use ube powder for this recipe? I would like to thank you for sharing your yummy puto cheese and coconut macaroons… because of your recipe, i got to have an extra income… my friends and colleagues really likes it! Yes Lalaine,I have been adding ube to my maja blanca for a change. Glad to see you have a recipe for one. Do you think adding ube to biko will work? I have this urge to add ube to every kakanin to seenif the taste will change. I haven’t personally tried adding ube flavor to biko but it sounds like a delicious idea. I found this Kapampangan recipe, Biko with kalabasa. Do you have to cook the frozen grated unit before adding to the milks…..or just defrost. Also is one package enough for one recipe. This recipe looks so good and delicious. I need to try this combination soon.